The College of Pharmacy and Pharmaceutical Sciences (CPPS) application is through the PharmCAS national application service for pharmacy schools. Within the PharmCAS application students will need to submit a professional goals statement. Read below for our complete application process. 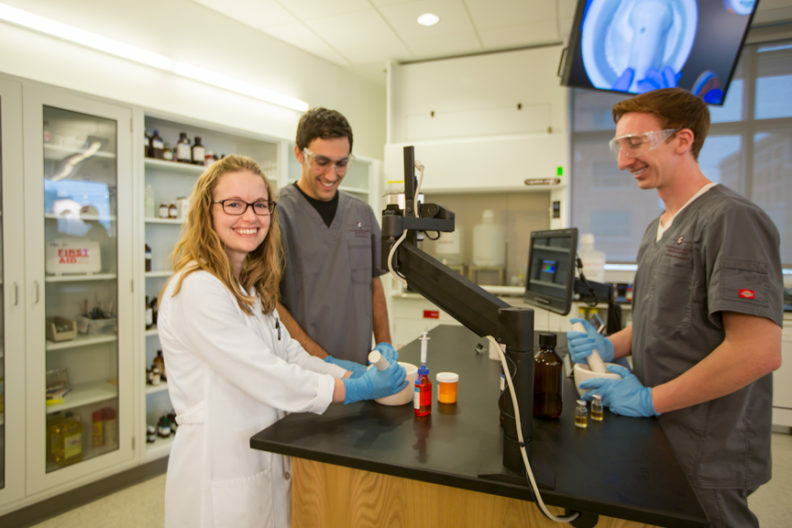 Early Decision: Early Decision is for students who are close to completing the pre-pharmacy undergraduate coursework and know that the WSU College of Pharmacy is their first choice pharmacy school. This is an application process through PharmCAS that allows you to apply for your top choice school early, and subsequently get your acceptance determination early. If you apply through the PharmCAS Early Decision process, then you are committing to enroll if you are accepted. If you are not accepted to WSU through Early Decision, you can then apply to other pharmacy schools through the regular PharmCAS admission cycle. Read more about the Early Decision process on PharmCAS. Regular Admission: Regular Admission is for applicants who want to apply to more than one pharmacy school. The two-part application process is similar to the Early Decision process, but with deadlines on a different timeline. Through regular admission, applicants have until early June to complete their application, and are notified of offer for admission on a rolling basis until June. Save-A-Seat: This option is for current WSU students from any campus and Heritage University undergraduate students who are working to complete their pre-pharmacy requirements and plan on applying to the WSU Doctor of Pharmacy program. The Save-A-Seat Program secures a seat in the program so you can focus on learning, not competing for a seat in pharmacy school. Click here to view the Save-A-Seat requirements and application process. Summer*: PharmCAS filing period opens. September 5: Early decision program: PharmCAS applicatons due. June 3: PharmCAS filing period closes. March 1: Save a Seat applications due. Get more deadline info on the PharmCAS deadlines web page. The professional goals statement must be submitted within the PharmCAS application. When composing your Professional Goals Statement do not submit a general essay. Directly answer every question since each question is evaluated. Take your time and write well thought-out responses to each question. The following information is regarding elements that are submitted through PharmCAS. The PCAT is not required and will not be used in the admissions scoring process. To be considered for admission your preferred overall GPA as reported by PharmCAS must be 2.7 or higher. If your GPA is lower but you have extenuating circumstances that you believe should be considered, you may write a letter to explain. Letters of explanation should be addressed to the Director of Student Services, and be sent to pharmacy.admissions@wsu.edu as a Word or PDF document. Two letters are required: one from a professional source and one from an academic source. Three letters are recommended. A letter from a pharmacist is not required but highly recommended. Academic sources include: professors or instructors who have directly interacted with the student in a classroom setting or official, university or college-affiliated academic advisors. Professional sources include: employers or volunteer organization personnel with whom the applicant has directly worked. Recommendations are NOT ACCEPTED from family members, friends, politicians, teaching assistants, fraternity or sorority advisors, personal health care providers or high school faculty/advisors. Recommendations are not accepted from career services or reference letter centers. In PharmCAS you will be asked to send official transcripts from all institutions that you have attended. Applications may be completed and submitted beginning mid-July. Consideration of complete applications for interview will begin the first week of August—first priority is given to completed early decision applicants and proceeds to regular decision applicants on a rolling basis. The number of interviews available is limited, it is to your advantage to apply as early as possible. Have all transcripts ready to send to PharmCAS to prevent delays in the release of your application. If PharmCAS does not receive all required materials and transcripts, they will not release your application to WSU for review. After your application, official transcripts and fee are received allow up to four weeks for PharmCAS to process your application. Our program deadline date for the 2018-19 cycle is June 3, 2019, 11:59 p.m. Eastern Time. The PharmCAS application deadline indicates the date your application and all materials must be received in the PharmCAS office. For application instructions to help with applying for Pharmacy school, please click the helpful link below. If you are offered admission to the Pharm.D. program, you will receive an email request from PharmCAS for information to allow a criminal background check. Be apprised that the Pharmacy Quality Assurance Commission can refuse to issue you a license to practice in the state of Washington due to a felony conviction. WSU will not automatically or unreasonably deny an applicant’s admission or restrict access to campus residency based on an applicant’s criminal history. While public institutions may or may not deny your admission based on a criminal record, you may not receive board approval based on a felony record. Since a board-approved internship licensure is required to complete the experiential portions of the professional curriculum, you would not be able to academically progress successfully beyond the first professional year. If you have a criminal conviction on your record you may not be able to complete your degree, regardless of whether WSU grants you admission to the Pharm.D. program. Interviews are conducted by invitation only on the WSU Health Sciences campus in Spokane, Washington and the WSU Doctor of Pharmacy program extension on the Pacific Northwest University of Health Sciences campus in Yakima, Washington. Interviews are conducted in-person only and are a required part of the admissions process. Interview invitations will be sent via email. If you are invited for an interview, you will visit with a faculty member and a student ambassador for about 30 minutes, receive a campus tour and meet current students and alumni. The entire interview process takes about 3 hours. Late October: Early decision applicants will be notified. June: All decisions made (offers, waitlisted applicants and denials). Pharmacy students may apply for financial aid and should submit the FAFSA online. Go to www.fafsa.ed.gov and use 003800 as the school code. Some loans for healthcare professionals require parent information, regardless of the student’s age and dependent status. If you have any questions about financial aid please contact spokane.financialaid@wsu.edu or 509-368-6956. Washington state residents are given additional consideration in the admissions process, however approximately 30 percent of the incoming class are out of state students. We do not consider international students for admission to the Doctor of Pharmacy program. Students from foreign countries who have become U.S. citizens, permanent residents, or who have a green card will be considered for admission if they have a critical mass (two years or more) of credits earned from post-secondary schools in the U.S. and upper division science courses were taken in the U.S. Anyone who holds international transcripts is required to have them evaluated by ECE, WES, or any similar translating service if you are requesting an unofficial evaluation of your coursework. The college may consider students who have previously attended another professional pharmacy program. Only students in good academic standing will be considered (proof of academic standing will be required). Students who have been decertified, or asked to leave their original program due to academic deficiencies, are not eligible for transfer into the WSU program. View the policy and procedures transfer requests document for further instructions.